Hey y’all! Good Morning and happy Monday! 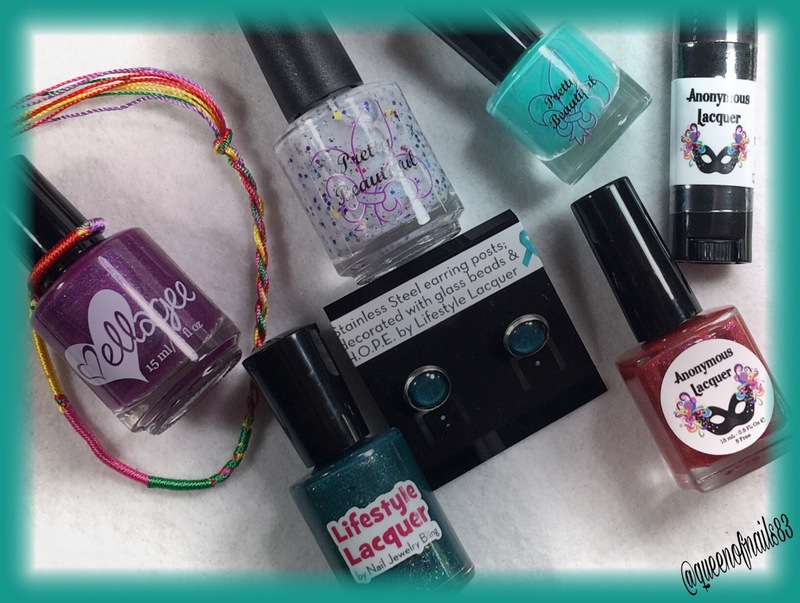 Today I have swatches of the newest Monthly Awareness Polish Box, Autism Awareness. 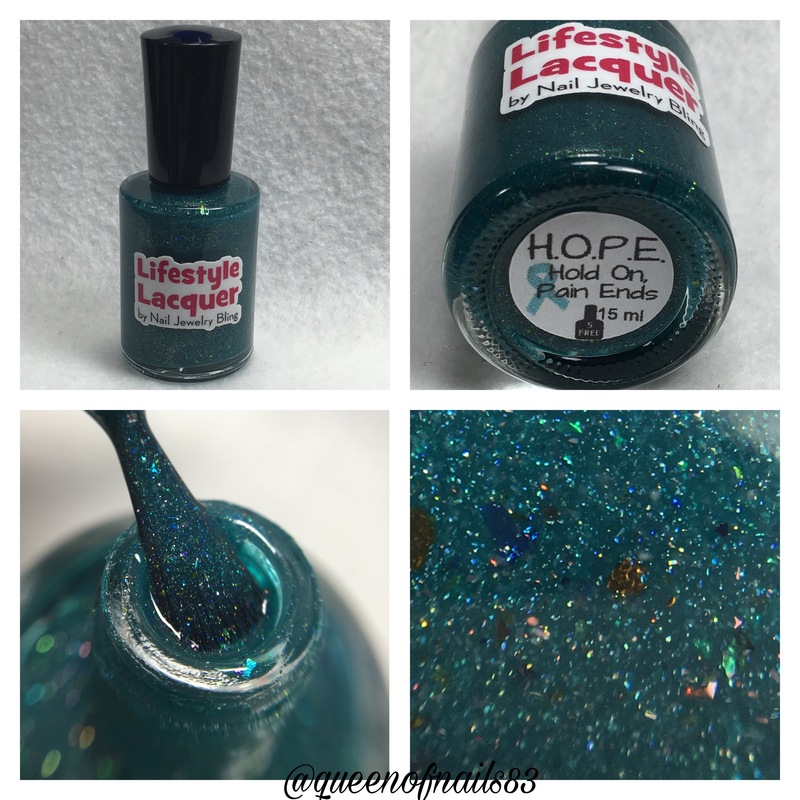 Before we jump into the swatches, let’s talk a little bit about Autism. So let’s not just think of these as “more polish” or “another polish box”, but think of the families that will be impacted from the donation made because of your purchase. 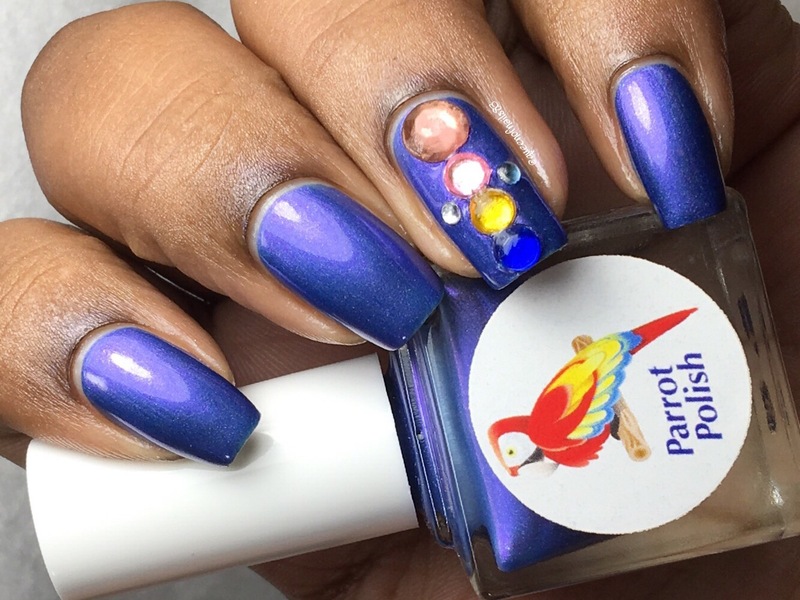 As you open each polish, think of it as unwrapping hope, joy, support, encouragement, awareness and most of all love. 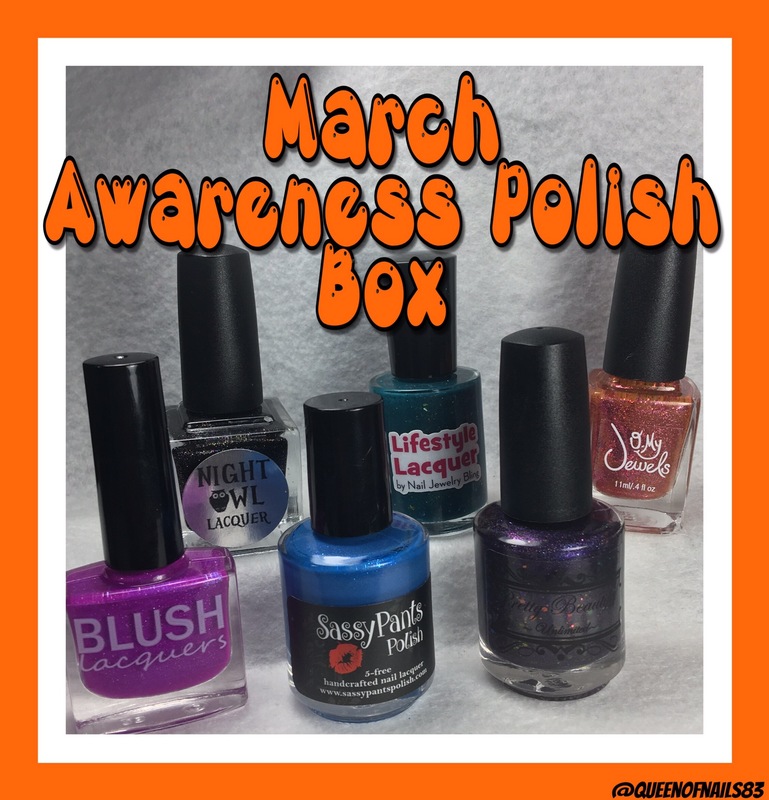 This month the Monthly Awareness Polish Box (M.A.P.B.) is supporting Autism Research Institute by donating 10% of all sales to this wonderful organization. Preorder started March 26th and goes thru April 9th and shipping will begin mid month. Please note, at this time international orders will not be accepted (this may change in the future). 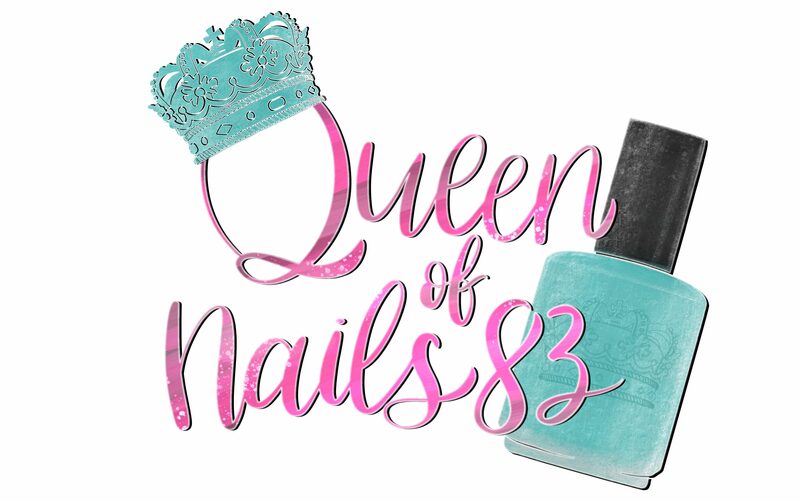 The cost is $52/box including all 6 polishes, $40 for your choice of 4 or $11/individually (applicable shipping rates apply). 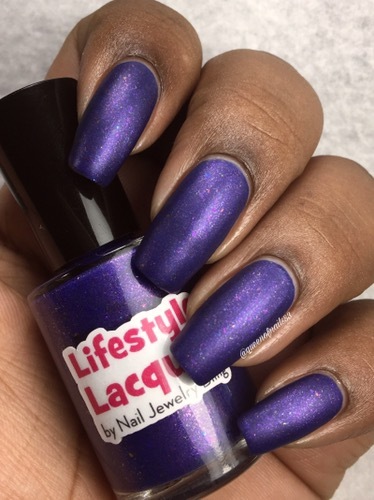 Love Needs No Words – A duochrome that shifts between shades of blue and violet with a hint of scattered holo pigment. 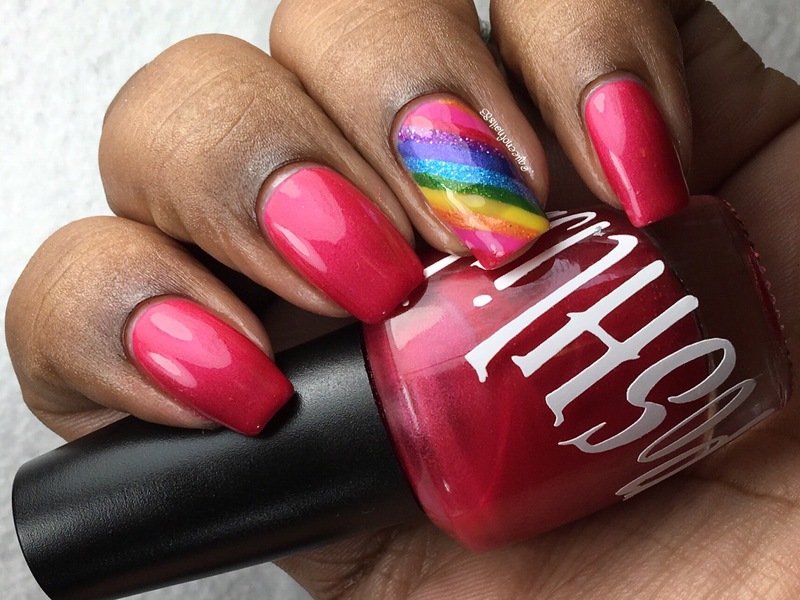 Swatch shown in 3 coats. 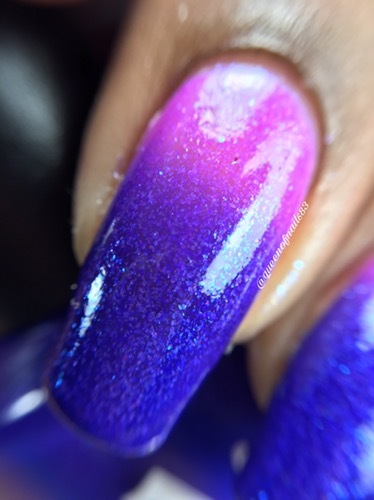 Close to Home – A purple cream with a great pink/violet and hidden holo. 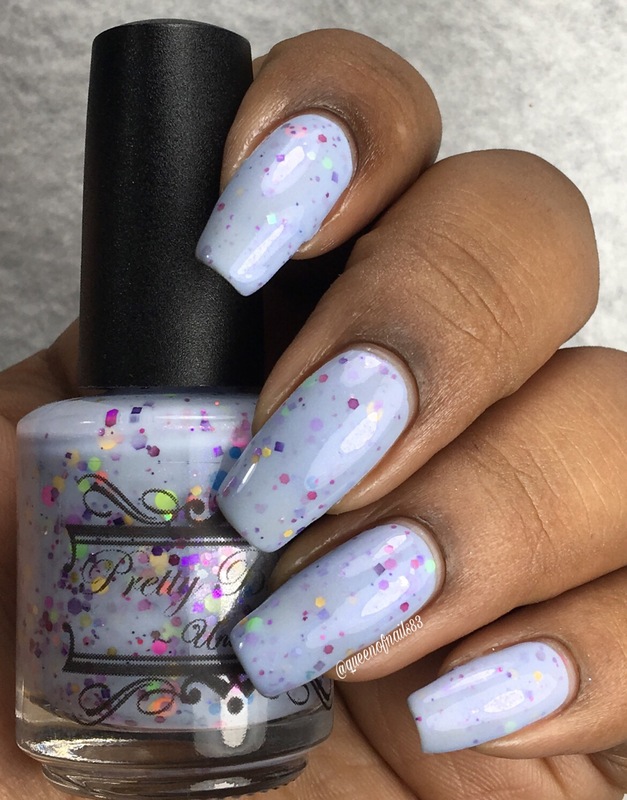 Swatch shown in 2 coats. 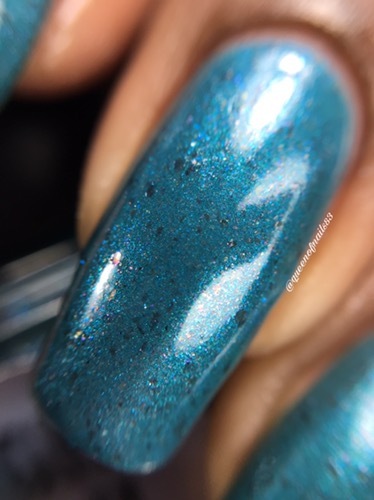 Loving Patience – A seafoam green with bright turquoise shimmer, crystal rainbow shifting flakies and some scattered holographic. 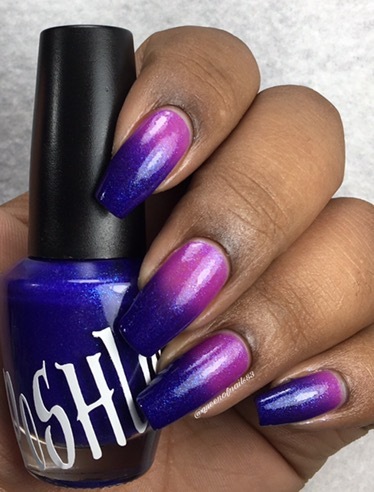 Swatch shown in 4 coats. I would definitely recommend thin layers or using white undies. 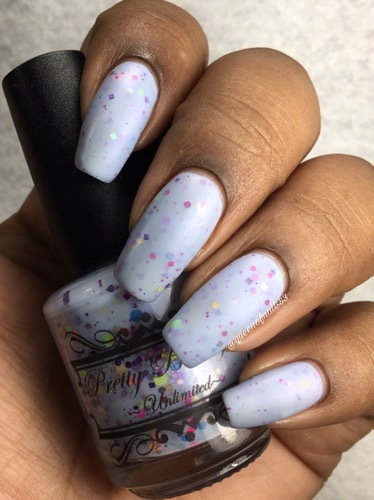 “All Over the Spectrum” light grey scattered holographic base with green, pink, purple, blue micro flakies and small to medium pink, green, purple, red, orange, turquoise and blue holographic glitter. 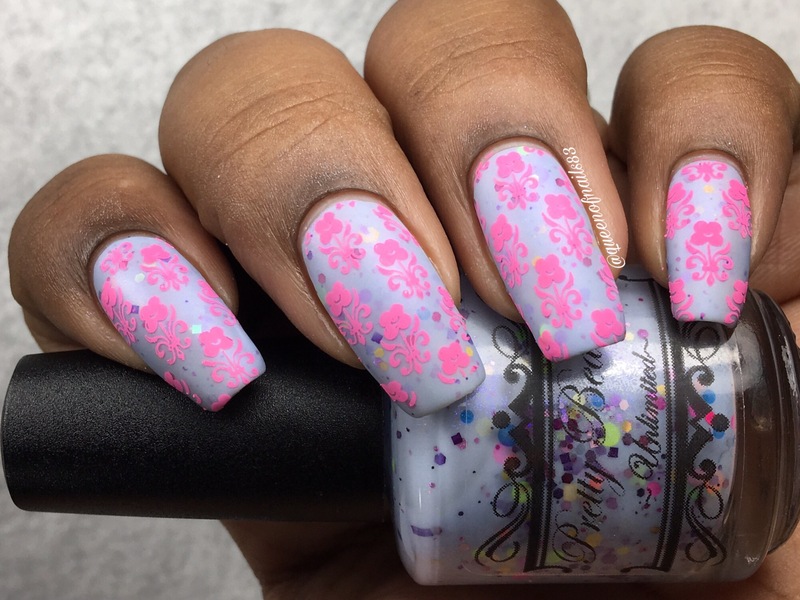 Swatch shown in 2 coats. “Kiss My Aspergers”. 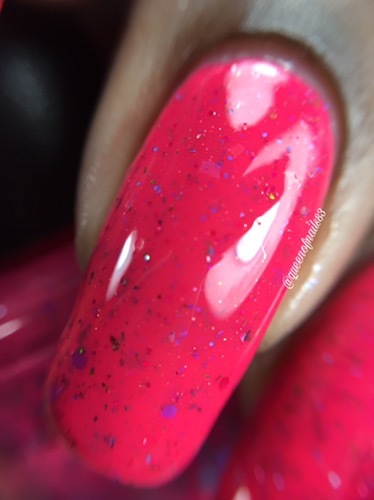 Is a very sparkly red jelly with red micro-glitters and red-gold micro flakies. 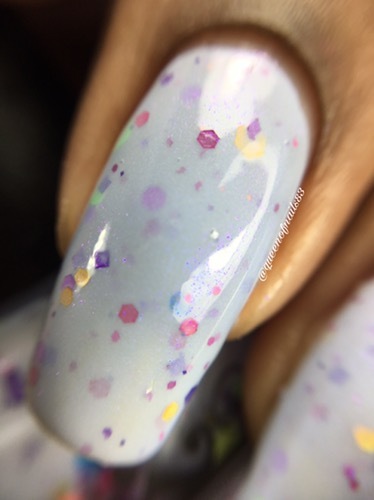 Swatch shown in 3 coats. I would recommend using undies to reduce VNL. 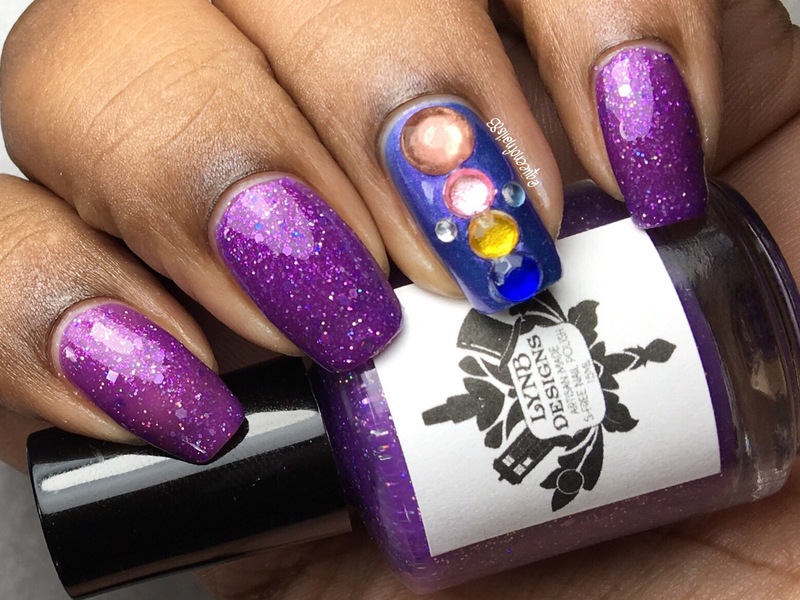 Sometimes Mysterious is yellow crelly base with pink to purple to blue to good UCC flakies, gold holo shreds, red shimmer and chameleon glitters in various sizes. 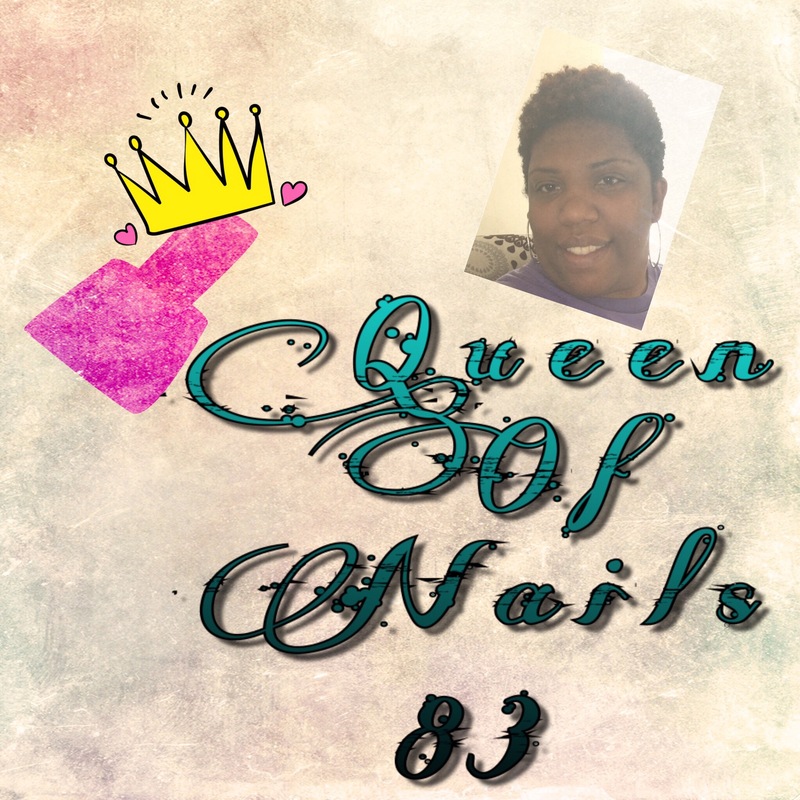 I am dedicating this post to a family member that continues to preserve over MS everyday. She is the sweetest, most kind-hearted young lady and has a smile as big and bright as the sun. You would never know her story and that she lives with this disease just by looking at her but she does, and she does it with such pose, positivity and optimism. So before you continue to read this post, please think about those you know personally or that friend of a friend, that mom, or co-worker that deals with MS and what supporting this fight means to them. Common symptoms include fatigue, numbness or tingling, weakness, vision problems, dizziness and vertigo and pain. While there is no cure for MS, there are now FDA-approved medications advances in treating and understanding MS are made every year. Women are at least two to three times more likely than men to develop MS. Most people are diagnosed between the ages of 20 and 50, although an estimated 8,000–10,000 children under the age of 18 also live with MS, and people as old as 75 have developed it. 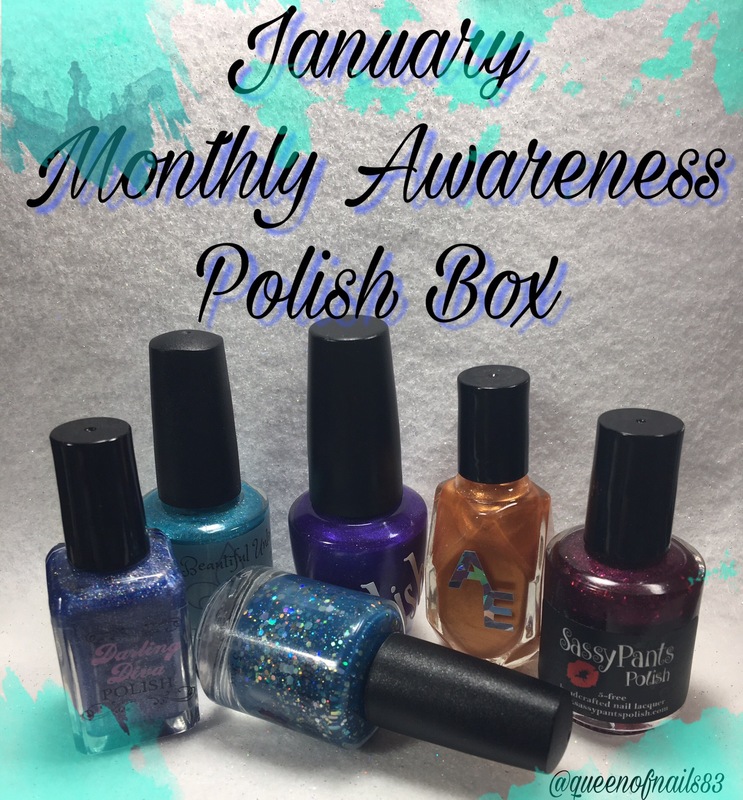 This month the Monthly Awareness Polish Box (M.A.P.B.) is supporting Band Against MS by donating 10% of all sales to this wonderful organization. Preorder starts February 26th and goes thru March 10th and shipping will begin mid month. Please note, at this time international orders will not be accepted (this may change in the future). 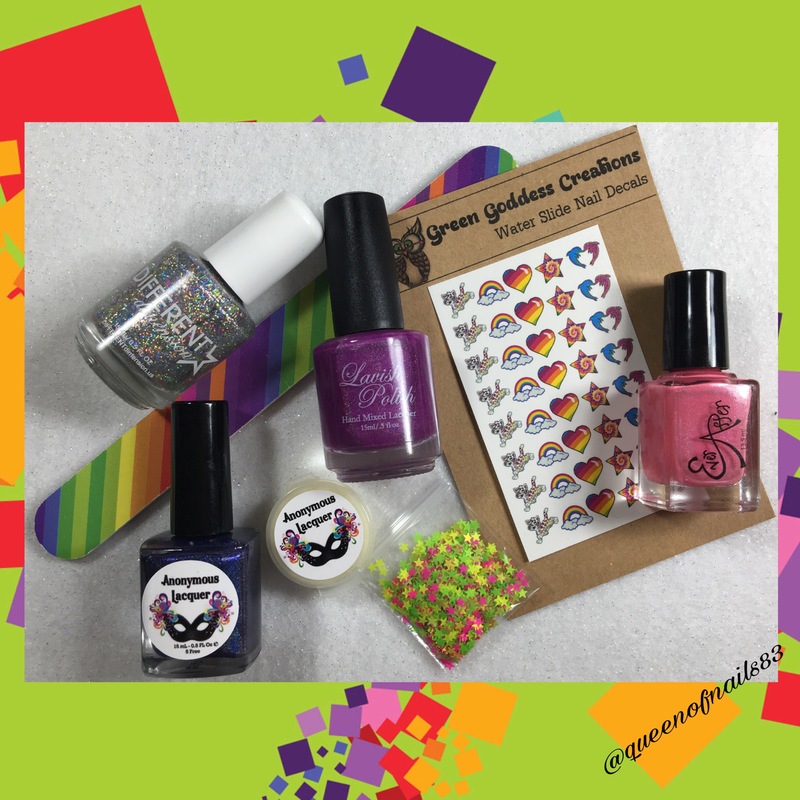 The cost is $52/box including all 6 polishes, $40 for your choice of 4 or $11/individually (applicable shipping rates apply). 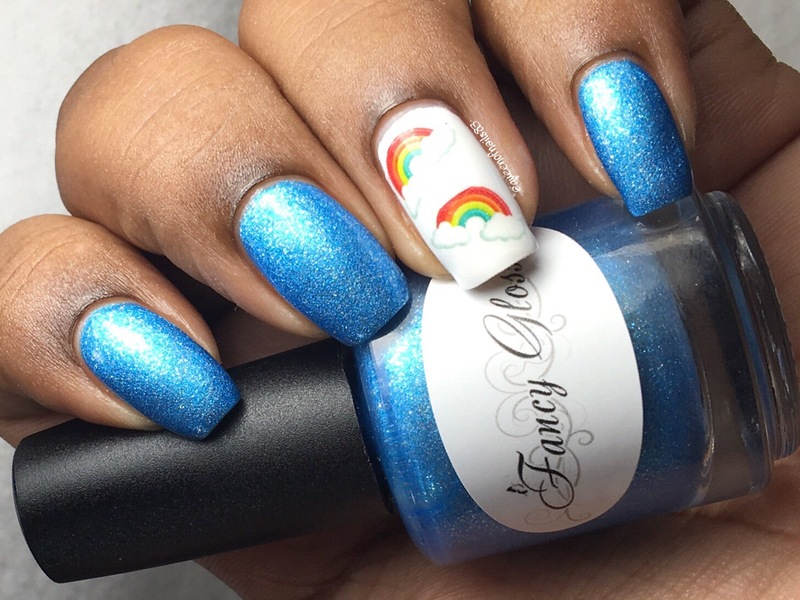 A cornflower blue with shimmer and smoky blue flakies. M.A.P.B. will be hosting a giveaway of this box. Be sure to check out the IG page for all the details to enter! GOOD LUCK!! No one or nothing can ever prepare you for the loss of a child and it’s the last thing you think of when you find out your expecting a child. The grief and devisation is something I can’t even imagine and my heart goes out to any family that has ever had go through this horrible experience of pregnancy and/or infant loss. Coping is often a lifetime struggle and support is always needed for the hundreds of thousands of families struck by this terrible circumstance. Since October has been declared “Awareness Month”, Robyn Bear, founder of www.october15th.com chose a day, in the middle of the month to become, “Pregnancy and Infant Loss Remembrance Day” (PAILRD). On this day, everyone in all times zones, worldwide, join in a candle lighting ceremony at 7pm on October 15th. I will definitely be doing this in remembrance of all the little angels gone too soon. 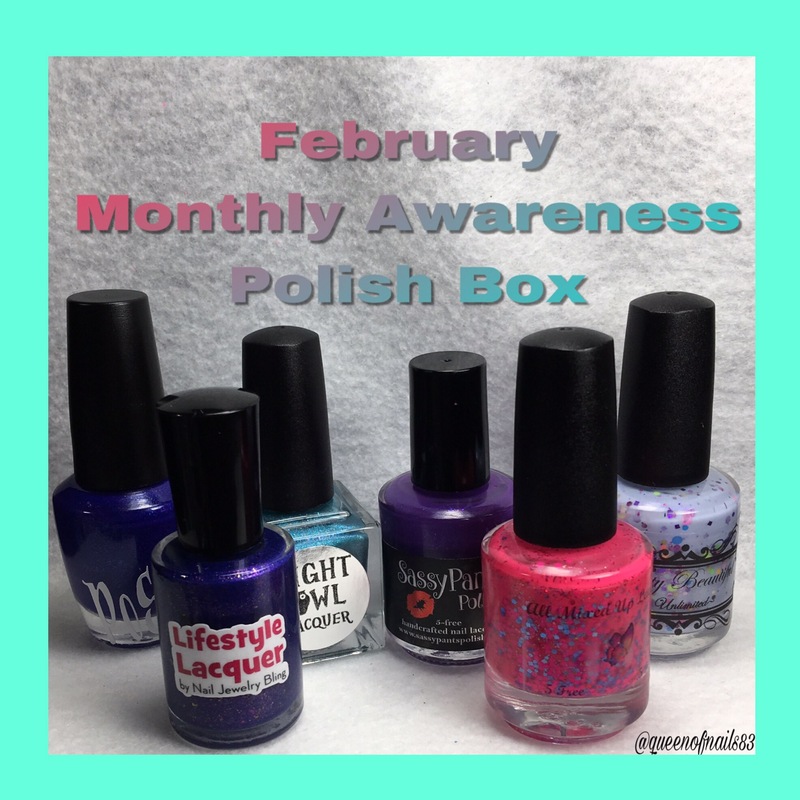 This month the Monthly Awareness Polish Box (M.A.P.B.) is supporting Infants Remembered in Silence, IRIS, by donating 10% of all sales to this wonderful organization. Preorder starts today, today, January 26th thru February 10th and shipping will begin mid month. Please note, at this time international orders will not be accepted (this may change in the future). 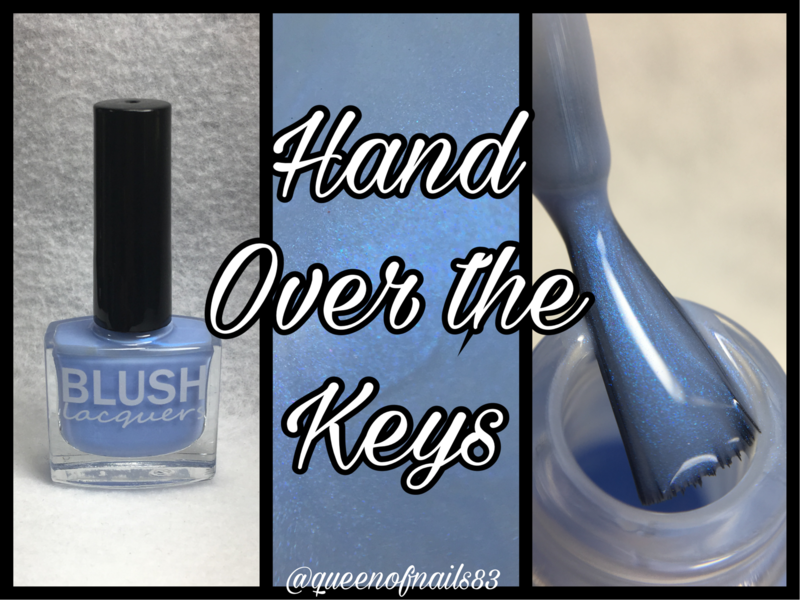 The cost is $52/box including all 6 polishes, $40 for your choice of 4 or $11/individually (applicable shipping rates apply). 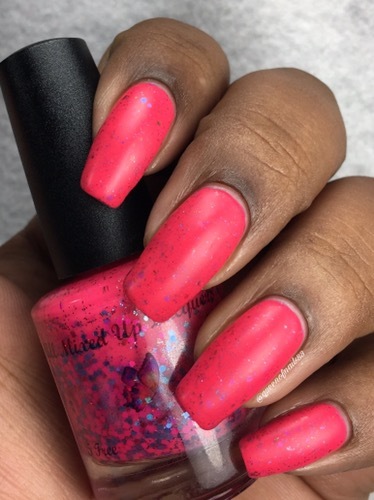 A bright to medium pink with rose metallic glitter, neon pink and blue holographic glitter of different sizes, ucc flakies and rainbow flakies. 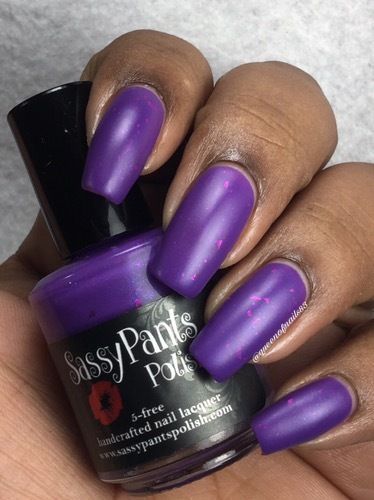 A vibrant purple polish with hot pink flakies and neon purple micro flakies. 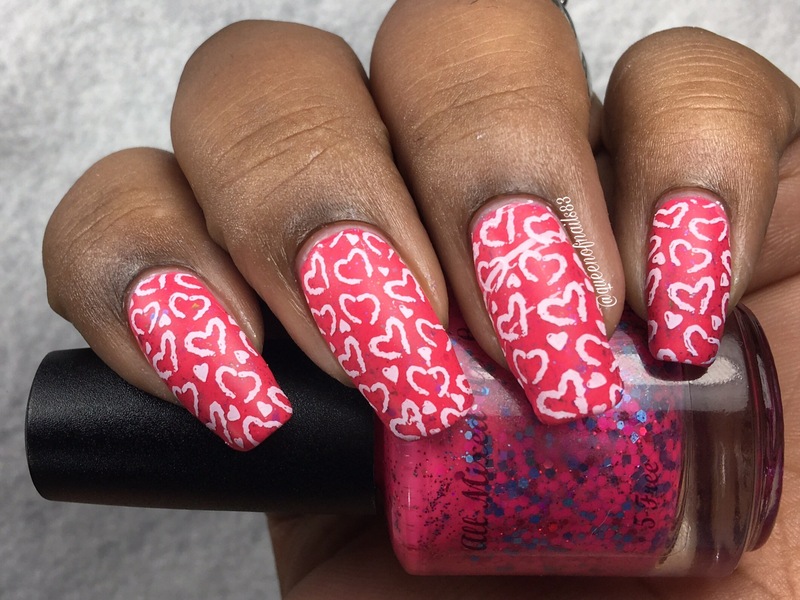 Hey y’all, today I’m back with another Monthly Awareness Polish Box (M.A.P.B.) this time it’s Alzheimer’s Awareness. Alzheimer’s, pronounced is ahlts-hahy-merz according to dictionary.com, is a common form of dementia, believed to be caused by changes in the brain, usually beginning in late middle age, characterized by memory lapses, confusion, emotional instability, and progressive loss of mental ability. Like most diseases, Alzheimer’s has a monumental effect on the person themself, it also traumatic effects on the lives of family members and care givers. Over the years the statics of this disease have continued and will continue to grow, its time we help! This month M.A.P.B. 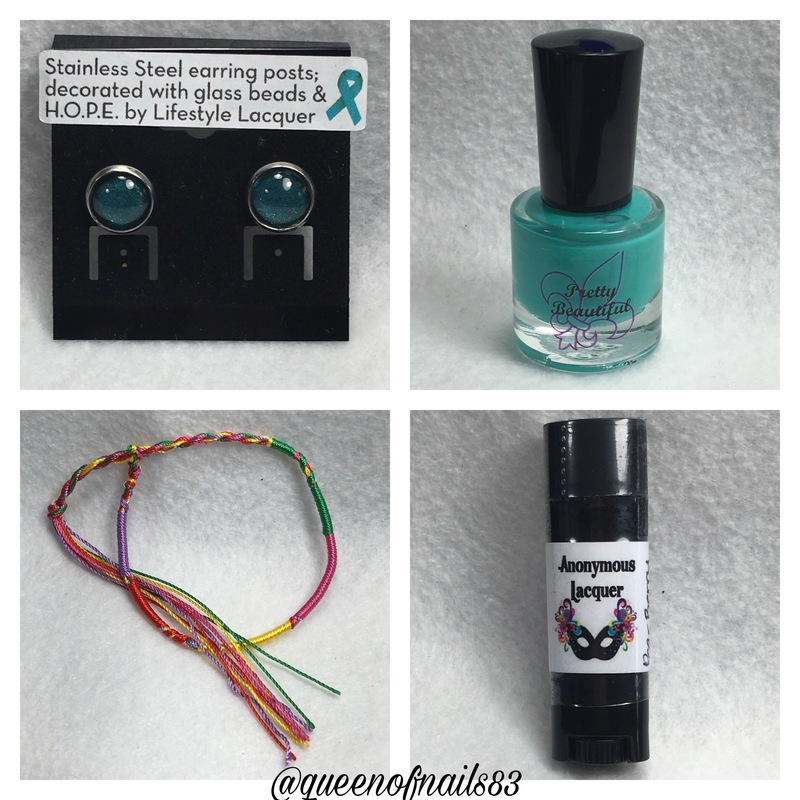 will donate 10% of sales to alz.org. Preorder starts today, Dec.26th and run thru Jan. 5th. Shipping will begin mid month, however, at this time international orders will not be accepted (this may change in the future). 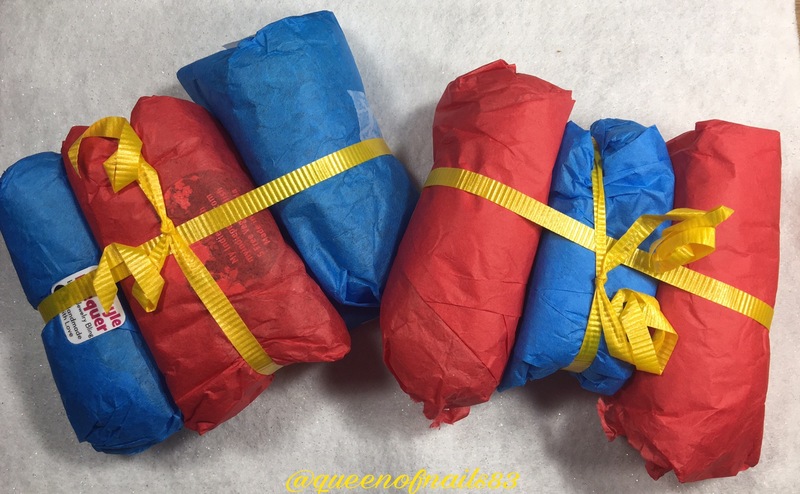 The cost is $52/box, $40 for your choice of 4 or $11/individually (applicable shipping rates apply). 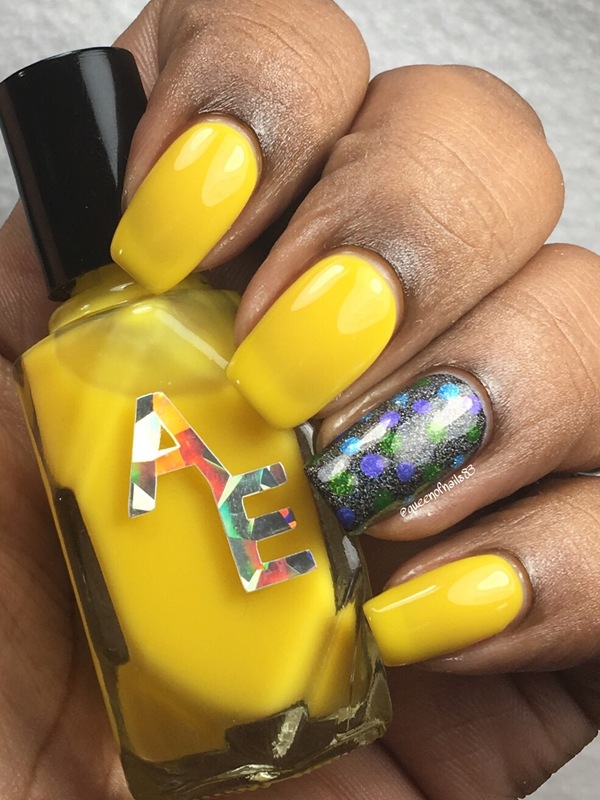 Fleeting Memories represents Stage 2 and is a golden orange holo with subtle shifts of yellow, green & blue. 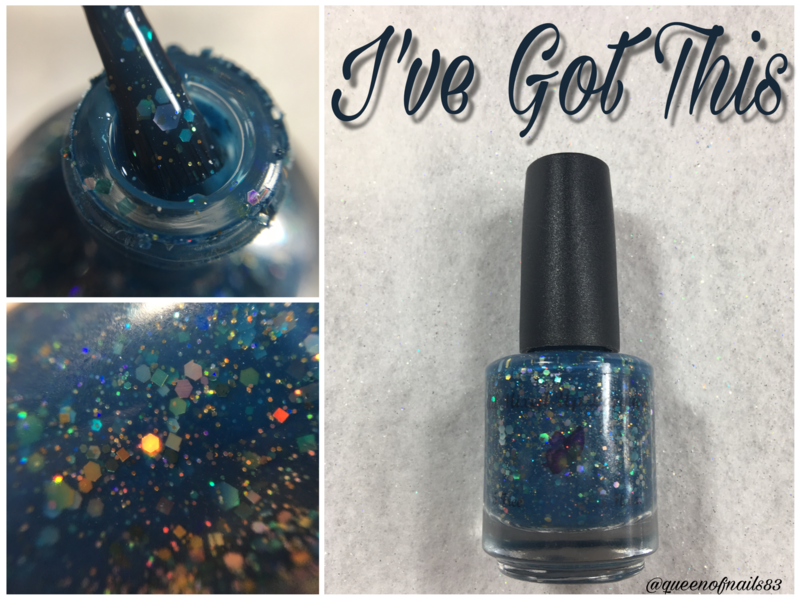 I’ve Got this represents Stage 5 and is a medium to dark blue crelly/jelly with gold and turquoise holograhic glitter, purple, green, and blue matte glitter of all sizes, and fine silver holo sparkle. 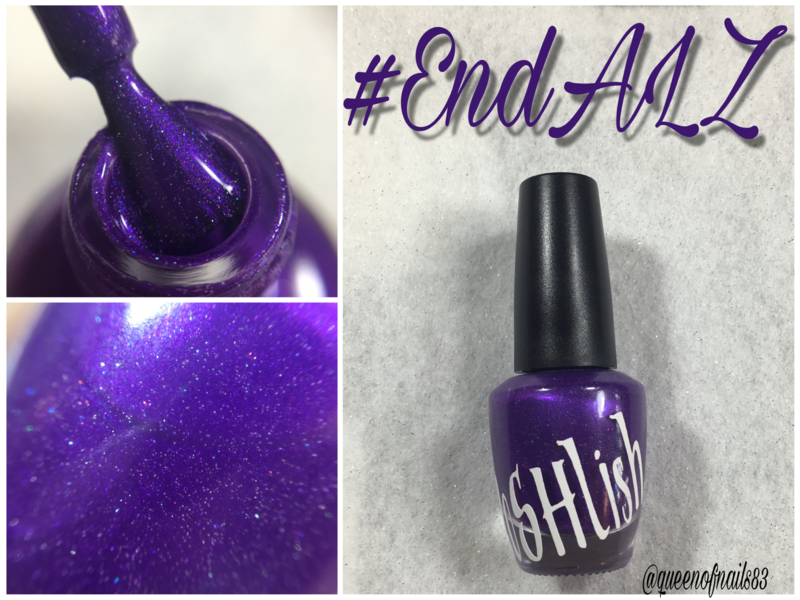 #EndAlz is a rich vibrant purple filled with a copious amount of silver holographic micro glitter. 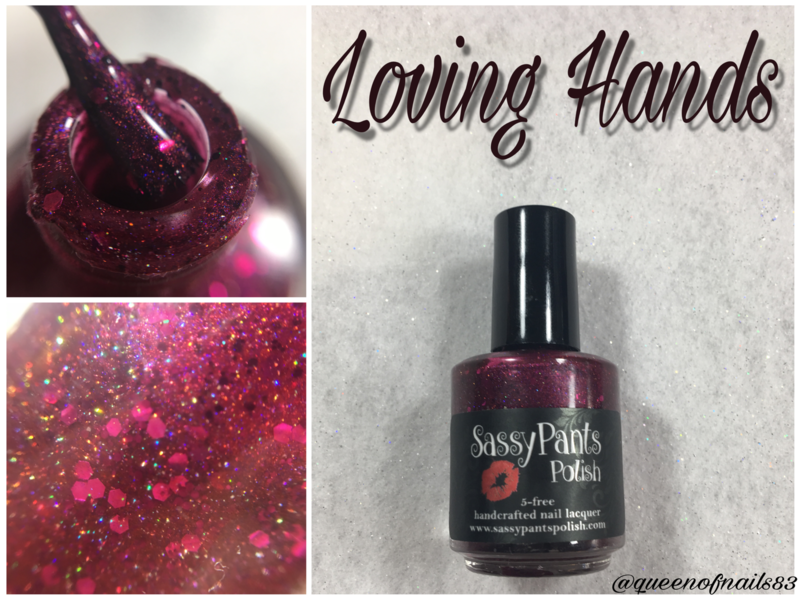 Loving Hands represents Stage 4th and is a cranberry red scattered holo with shimmer and garnet and pink berry hex glitters. 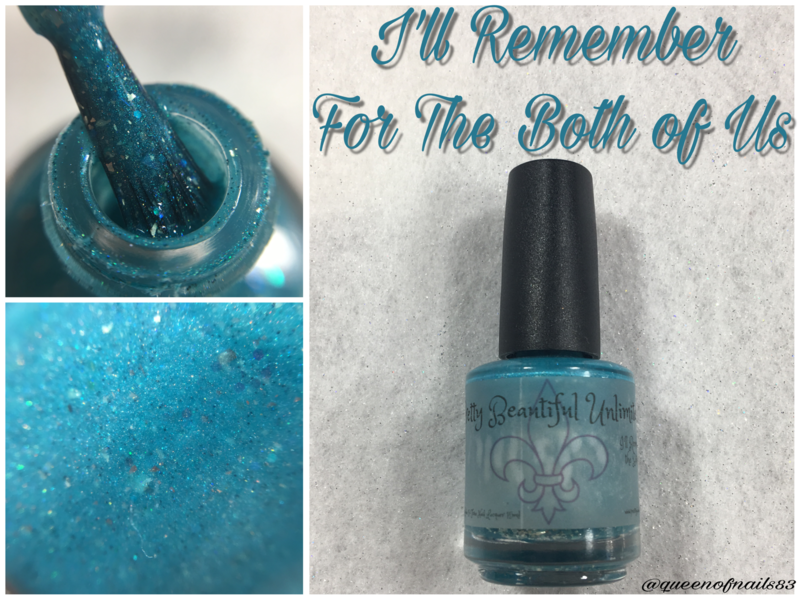 I’ll Remember For The Both of Us is a thermal shifting seafoam with iridescent and silver flakies. 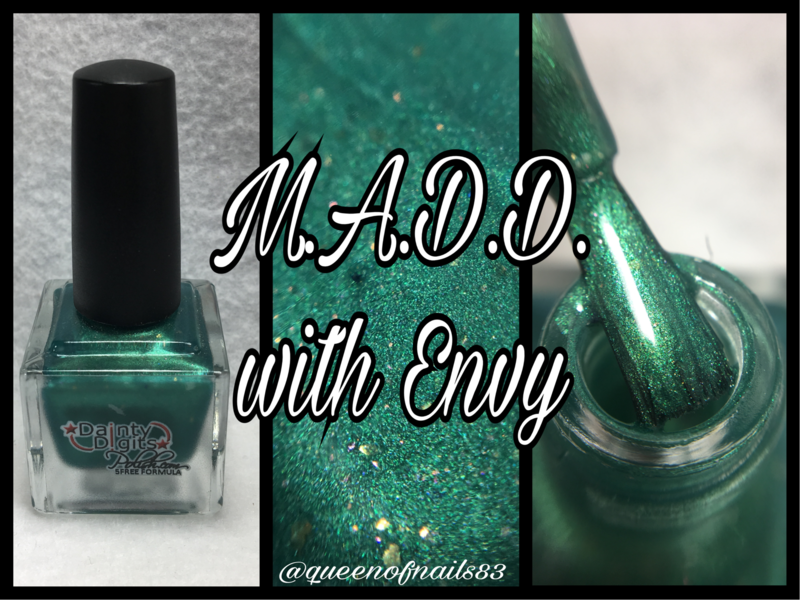 November 25, 2016 January 1, 2017 by queenofnails836 Comments on December Monthly Awareness Polish Box: M.A.D.D. Another month, another box, another worthy cause. 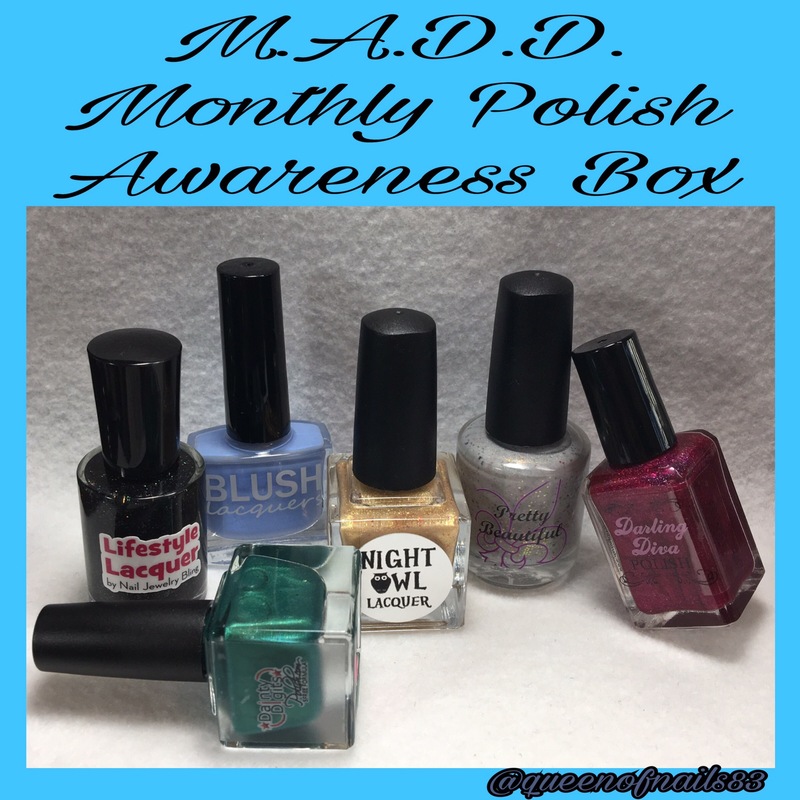 Last month’s Awareness Polish Box focused on Lung Cancer, this month…we are M.A.D.D. (Mothers Against Drunk Driving). I remember that first time I heard of M.A.D.D., it was 1999-2000 and I was a junior in HS. Right before prom, they had all the juniors and seniors come outside to the front of the school where a car crash had been staged to show the life changing and damaging effects drinking and driving could have on ones life. Not just those involved but the family and friends too. Now mind you, in HS we were not of legal drinking age, but the message was, and still is, extremely important, DO NOT DRINK AND DRIVE! Or, for that matter, get in the car with someone who has been drinking. As I continued to read and research more about M.A.D.D. the madder I got, but then I remembered that knowledge is power. So, my plea and call for action from todays post is that we unite together and stand firm that we are M.A.D.D.!!! The facts are alarming but we don’t have to stand for it any longer. 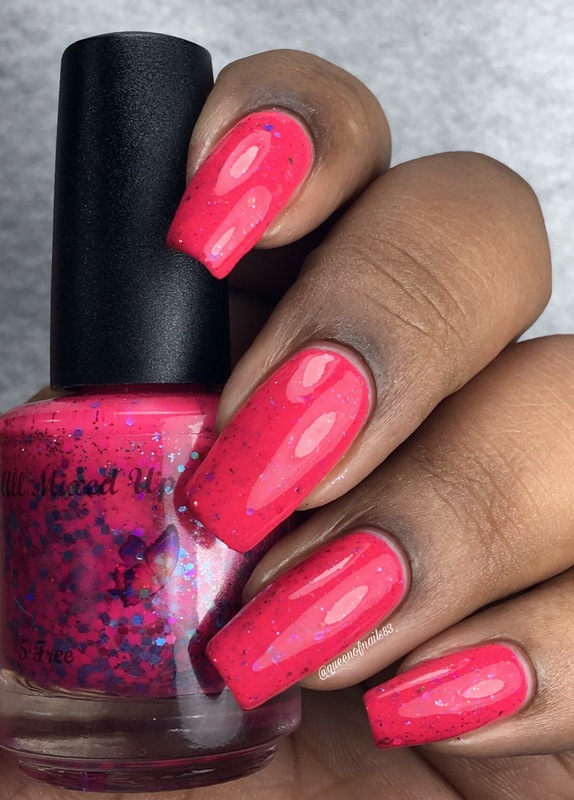 Every month the Month Awareness Polish Box will donate 10% of each box to a specific charity or cause, this month proceeds are going to M.A.D.D. Orders for this box will start Saturday, Nov.26th thru Dec. 5th and start shipping will begin mid month. At this time international orders will not be accepted but that may change in the future. 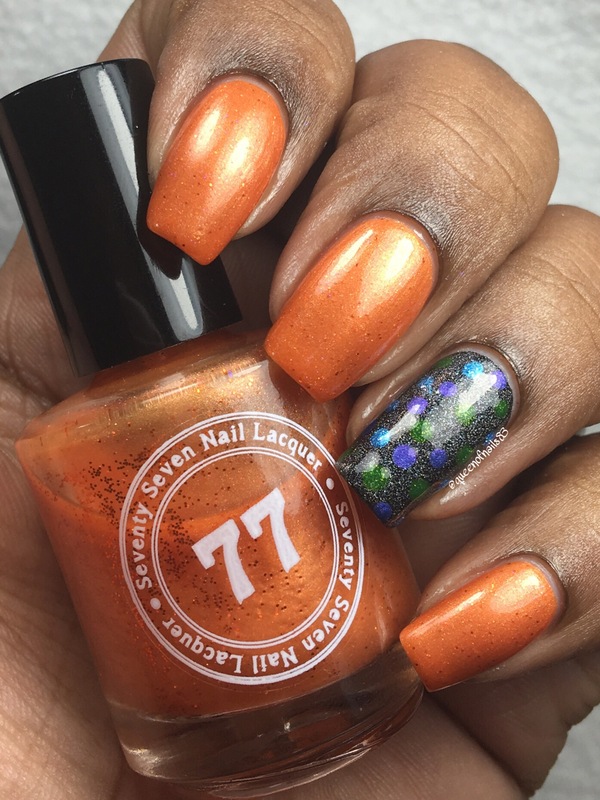 Overcoming Gray Skies: a medium gray crelly with copper shimmer, UCC flakies that shift copper, gold and green, chameleon micro glitters and red hook micro shreds. M.A.D.D. 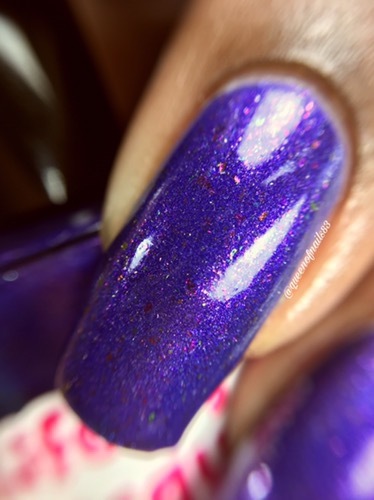 with Envy: an evergreen with golden and green/blue/purple UCC flakies. Always Count The Cost: a light gold with gold holographic micro glitter and red holographic shreds. You can help fight this war and support small business by purchasing this box for $52 + $6.80 shipping. It’s always a privilege to be asked to swatch for a maker but this S&R is a little different because there are 4 makers in 1 box. These 4 phenomenal makers came together for 1 amazing cause….Substance Abuse Awareness. 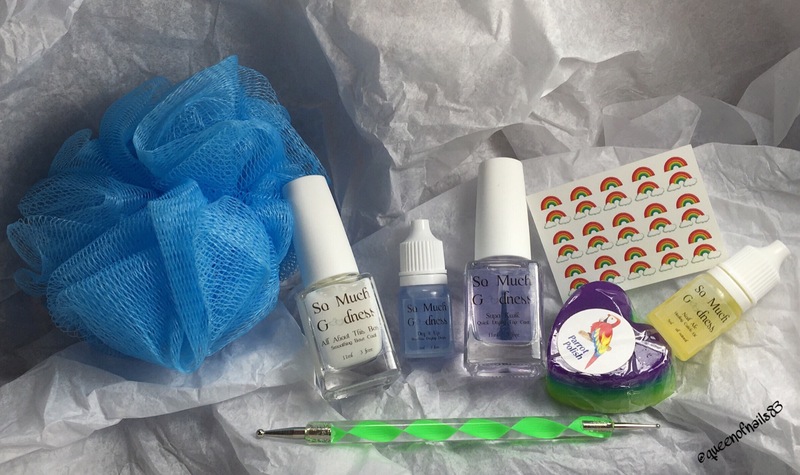 By now I know you all have heard of the makers and their brand but you may not have heard about the Substance Abuse Awareness Collaboration Box. This box is the product of a very special FB group, Substance Abuse Awareness and Polish (SAAaP), created 5 months ago by a good friend of mine, Mandy Wynder. The focus of this group is to provide support to people in recovery from addiction OR those who want to be. 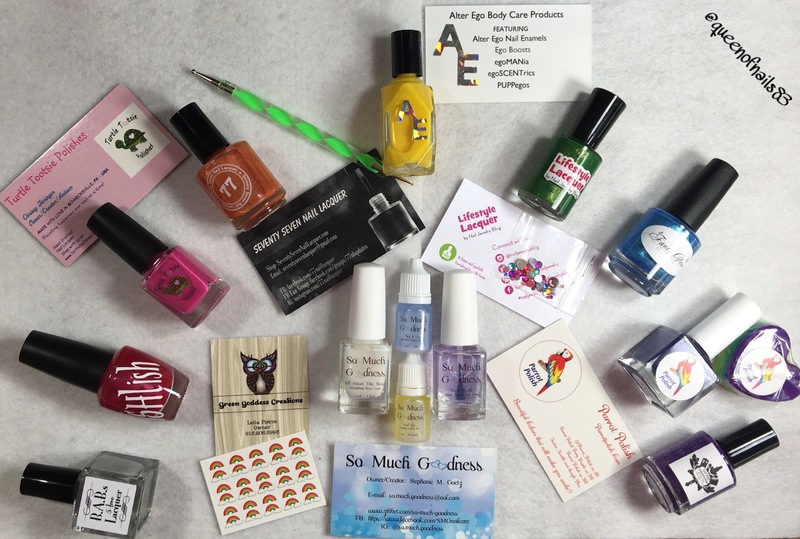 Not only does this group provide a safe outlet through polish but this group helps raise money for addiction based charities through the sale of its polish box. To date, the Substance Abuse Awareness Box has donated $515 between 2 wonderful charities, Drug Free and THP Purple Project. This box will help support the National Coalition Against Prescription Drug Abuse (NCAPDA). 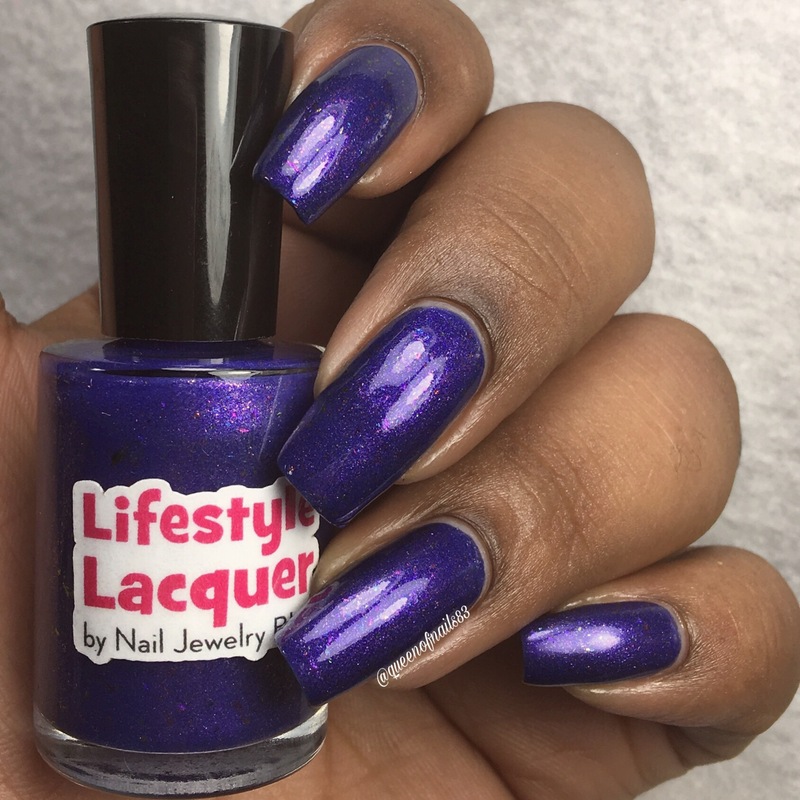 The 1st box included: Black Lace Cosmetics, Heathers’s Hues, Pink Hibiscus Beauty and Lifestyle Lacquer. This go round, you’re in for 4 very special treats! 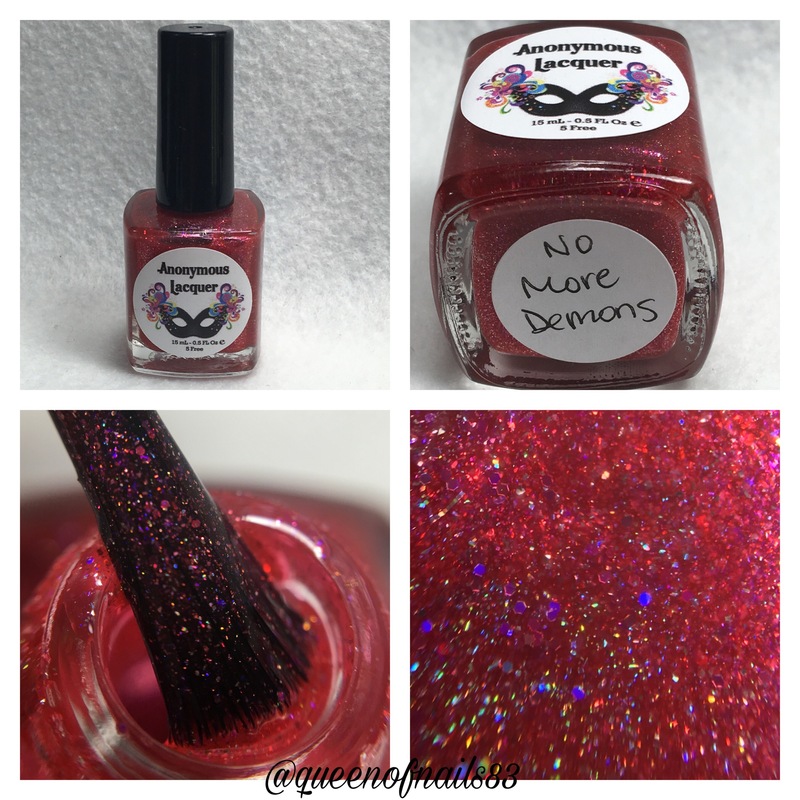 No More Demons is a watermelon colored jelly with different sparkly red colored micro flakes and holo flakes. 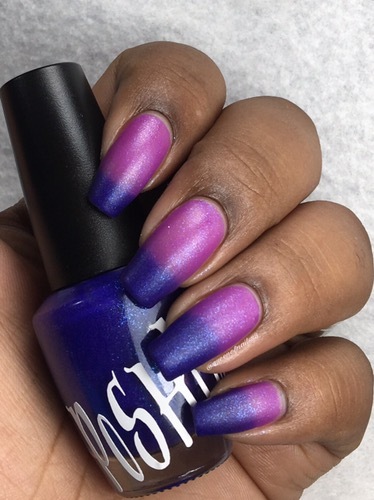 Swatches show in 3 coats. H.O.P.E. 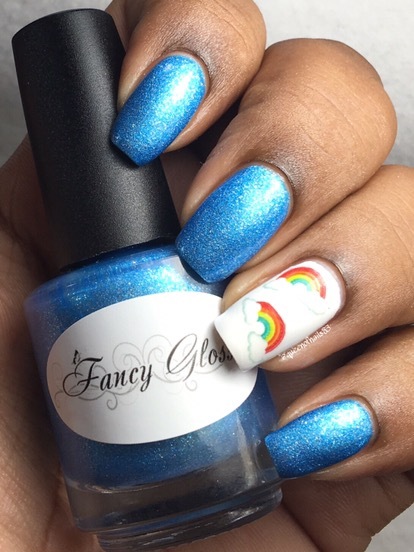 is a turquoise holo jelly with shimmer and gold/green UCC flakies. 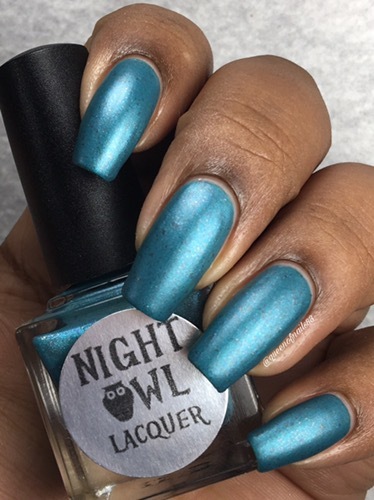 Swatches shown in 3 coats. 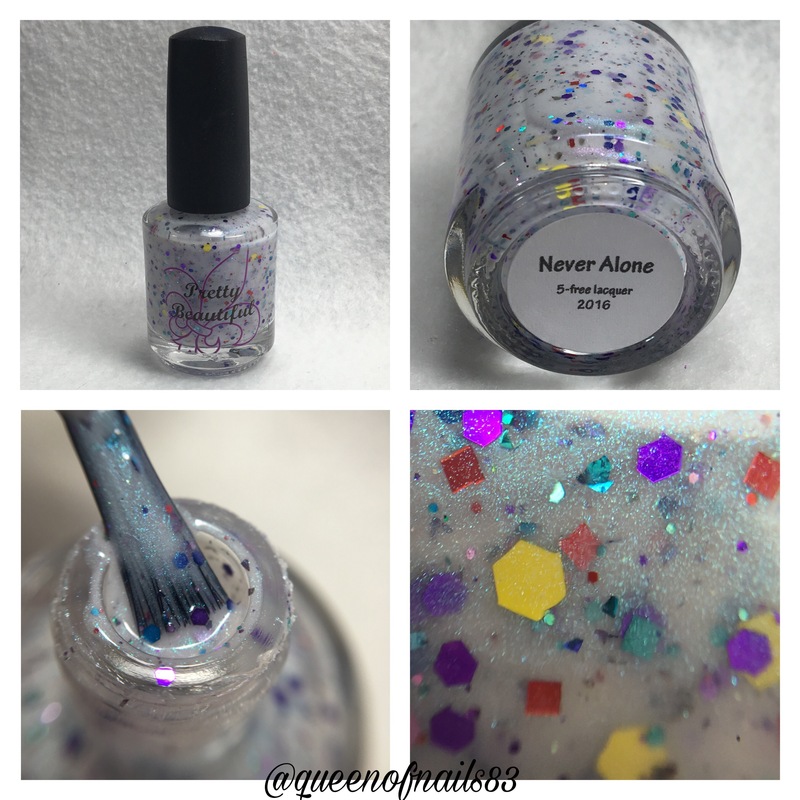 Never Alone is a white crelly base with turquoise shimmer, purple, red, yellow and turquoise glitters and UCC flakies. 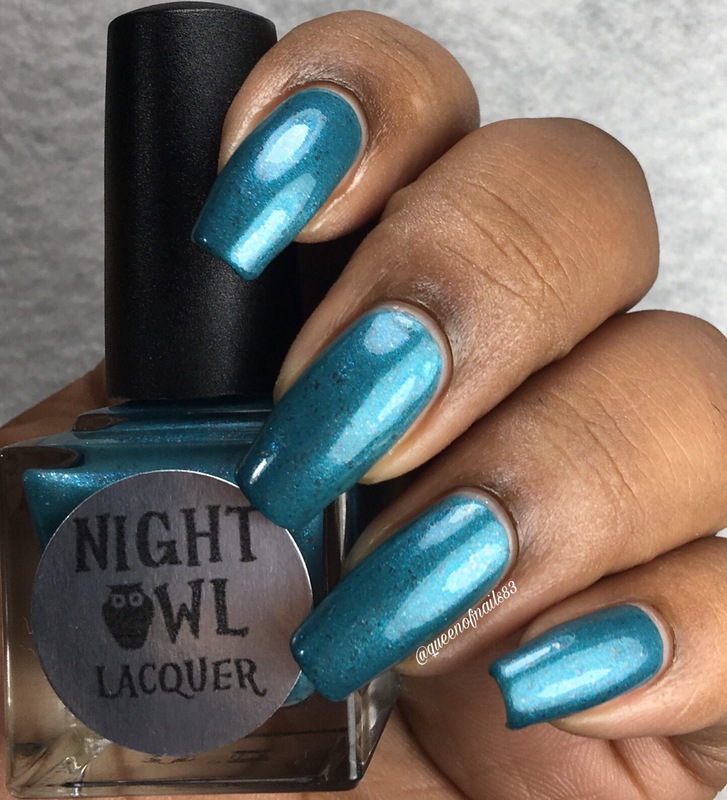 Swatches shown in 3 coats. The facts given throughout my post are alarming. We have to do something and that time is now. It’s imperative to raise awareness about this disease and we can do that by purchasing this box and those yet to come. You may not be affected by this epidemic, but I’m sure you or some you know is. This is your chance to help make a difference in that persons life. Sssshhhh…here’s a little secret, SAAaP is trying to re-release the 1st box after this one (before the 4th one come out). So be on the look out for more info so you can score that box and support this cause. 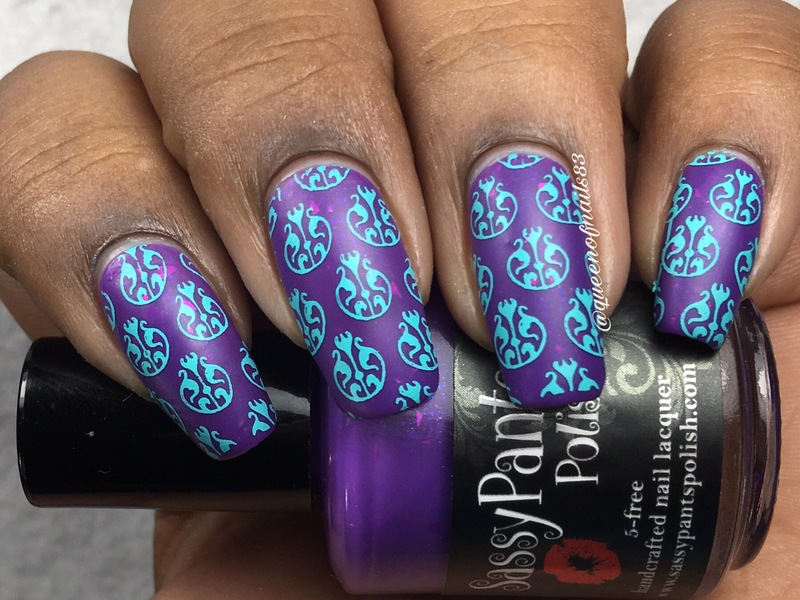 I wish I had more time today to show you some cool nail art I’ve done with this box, but I guess you’ll just have to join me over on IG for those manis. 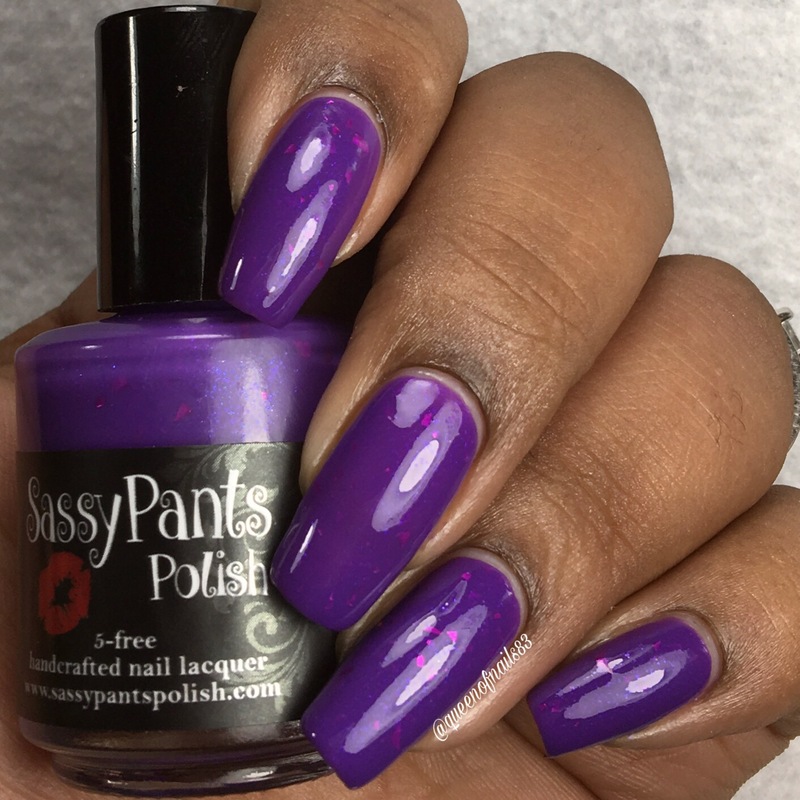 Until then, please enjoy more swatches and reviews from: Mandy Wynder, Beth Morehart, Jennifer Morgan and Sarah Kapperman. Happy Monday folks and Happy Labor Day! I know most of you are off from work/school, enjoying your long weekend and for many of us, the “unofficial end of summer.” If you’re like me, you probably enjoyed time with family, a good barbeque and time at the pool. But that is not the case for everyone. Some have family, friends and loved-ones that are fighting for their life and need support. That is the case of our very own, Stephanie of SoMuchGoodness. Many of you may know the story but for those that don’t, Stephanie’s niece, Rachel (pictured above) is a beautiful, 20 year old young lady who loves Scooby Doo, the color blue, her cat, Buffy, horror flicks, classic rock, adult coloring books, comfy clothes and always full of smiles. Rachel is currently in the hospital battling for her life. On June 14, 2016, Rachel was admitted to the hospital with sepsis, endocarditis (infection of the heart valve) and septic emboli in her lungs from a staph infection. Rachel’s mom/Stephanie’s sister, Rebecca has been there with her daughter every step of the way and has exhausted all of her paid time off from work never to leave her daughters side. As you can imagine, bills and hospital costs are piling up. Going through difficult times is stressful but to know you have physical, emotional and financial support is HUGE! Even the smallest gesture helps in the biggest way and when people step in to help, it’s nothing short of a blessing. That’s exactly what Mandy Wynder, creator of FB group Substance Abuse Awareness and Polish did. 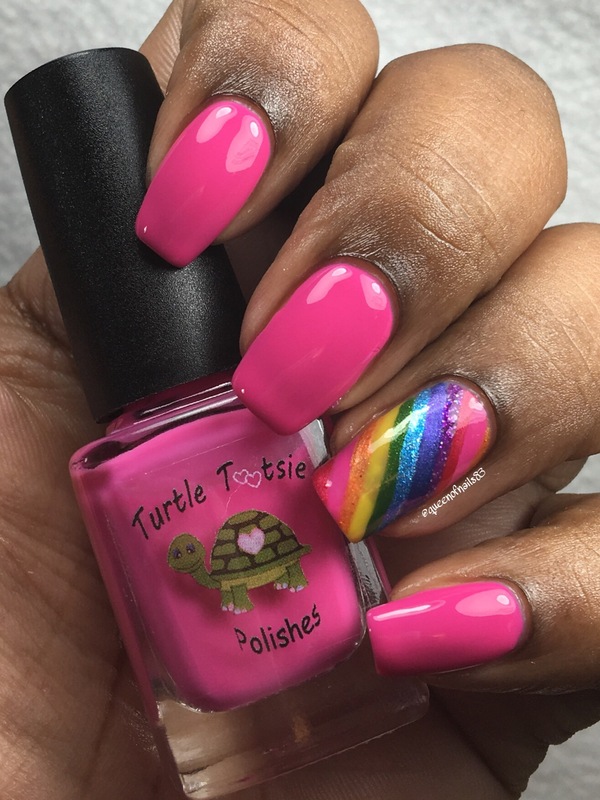 Mandy stepped in to spearhead Rachel’s Rainbow Box and in less than a months time, she created the planning group, organized the makers and gathered the swatchers/bloggers. This box is so important, because it gives Love, Hope, Perserverance, Joy, Courage, Power, Valor and Strength to those who need it most. 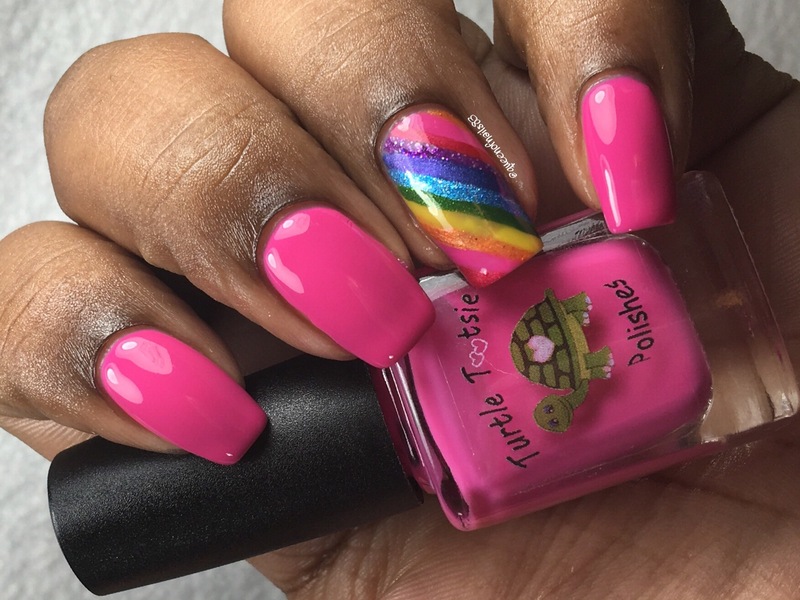 Are you ready to see Rachel’s Rainbow Box? Let’s get to it! 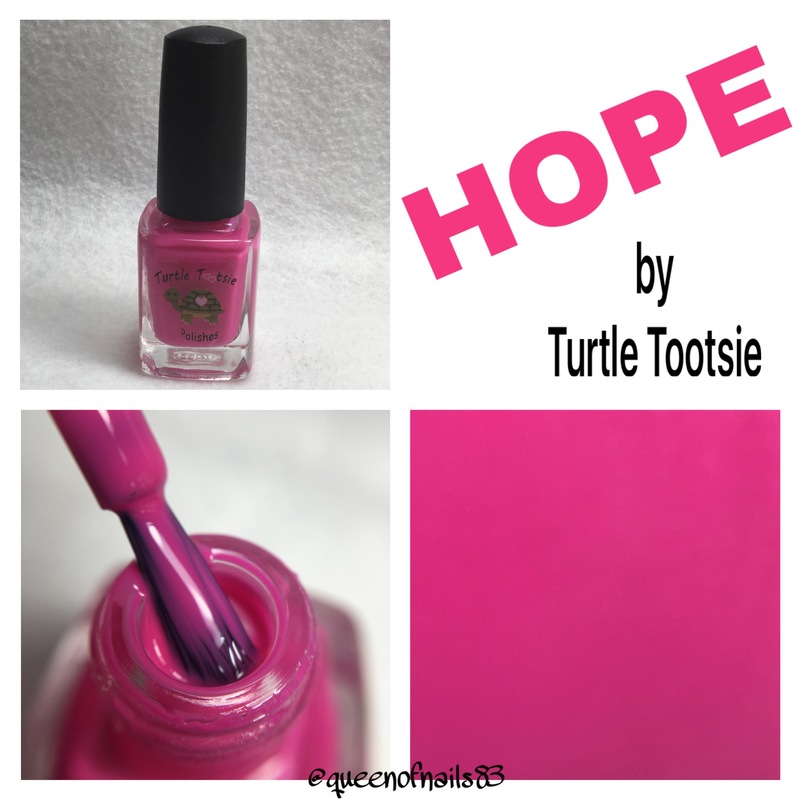 Hope is a pink crelly shown in 3 coats to reduce VNL. 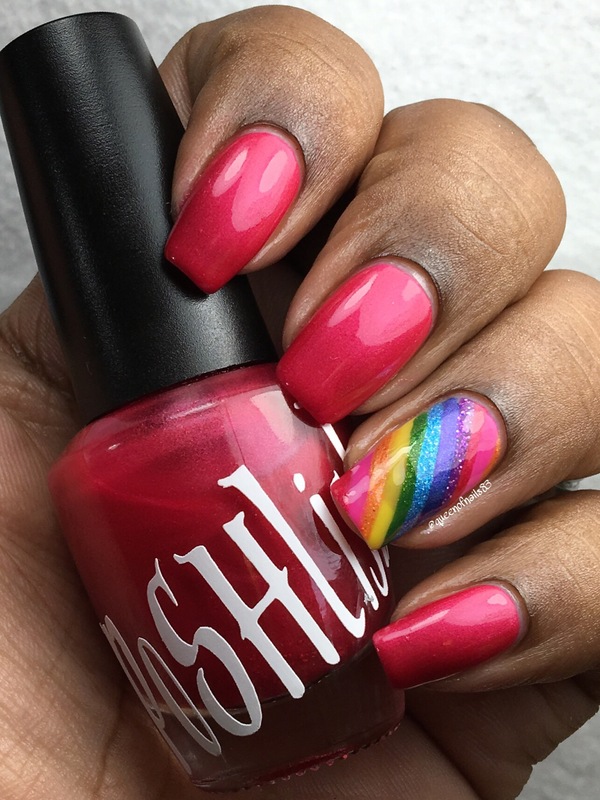 Accent finger is the rainbow using all the polishes of this box. 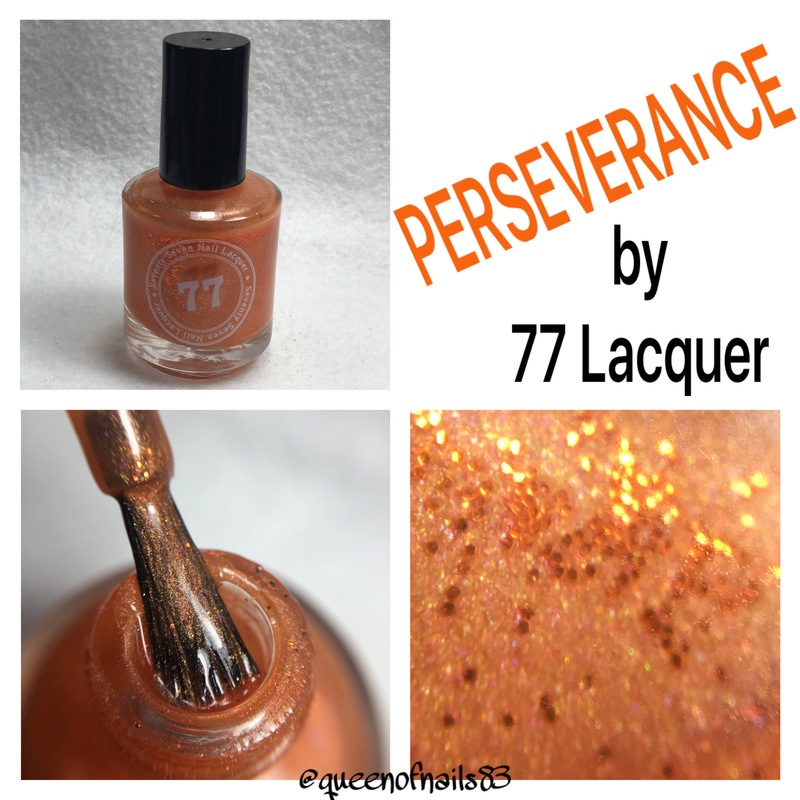 Perseverance is an orange jelly packed with small, gold hex glitter and gold micro glitter. Shown in 3 coats to reduce VNL. 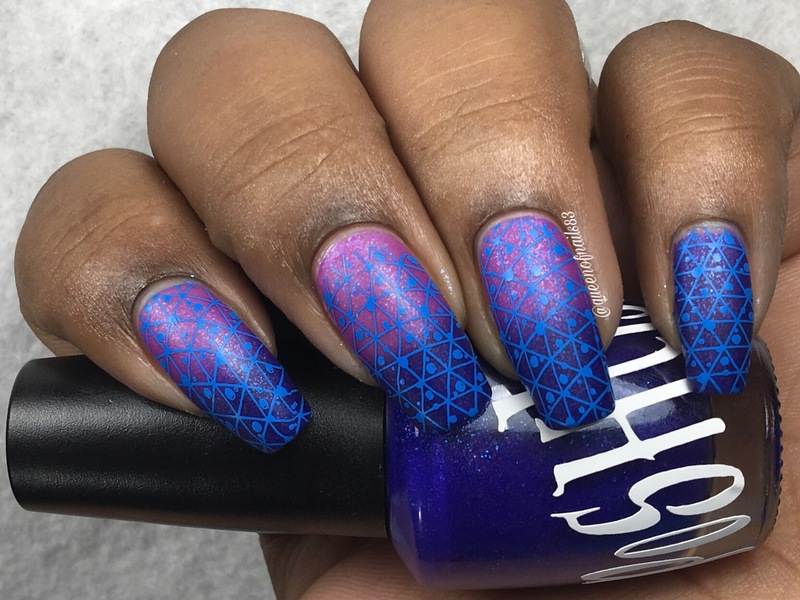 Accent finger is a dotticure using a black base topped with Holographic Top Coat by Christy of B.A.Bs, Dots done with dotting tool from 77 Lacquer and green, blue and indigo polishes from this box. 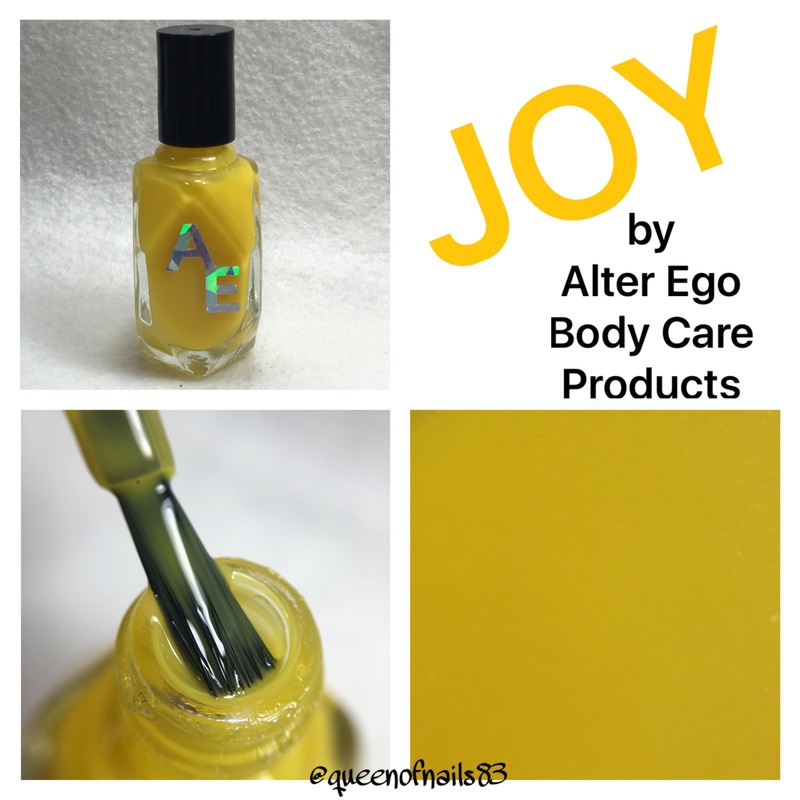 Joy is a yellow jelly shown in 4 coats to reduce VNL. 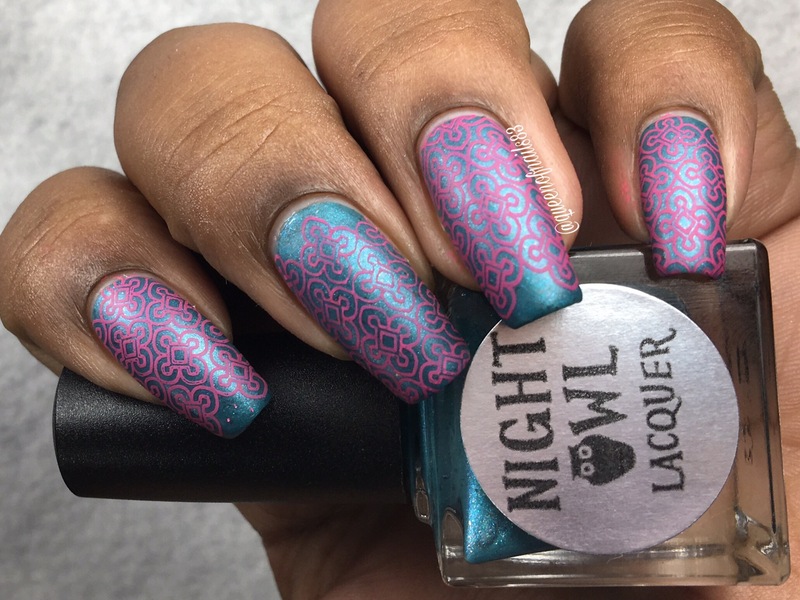 Accent finger is a dotticure using a black base topped with Holographic Top Coat by Christy of B.A.Bs, Dots done with dotting tool from 77 Lacquer and green, blue and indigo polishes from this box. 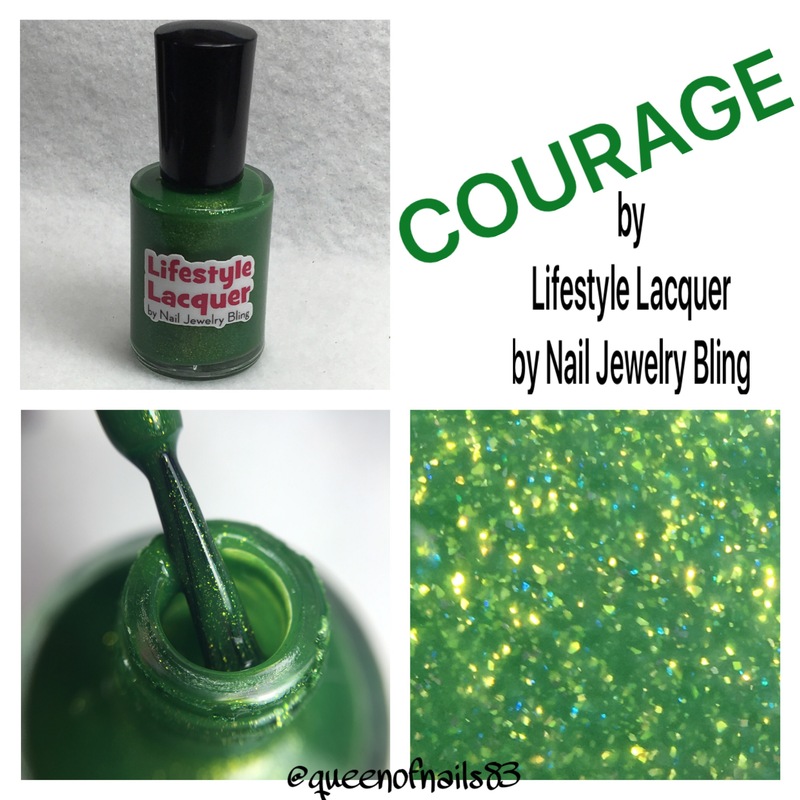 Courage is a green crelly with gold and blue micro glitter. Shown in 3 coats to reduce VNL. 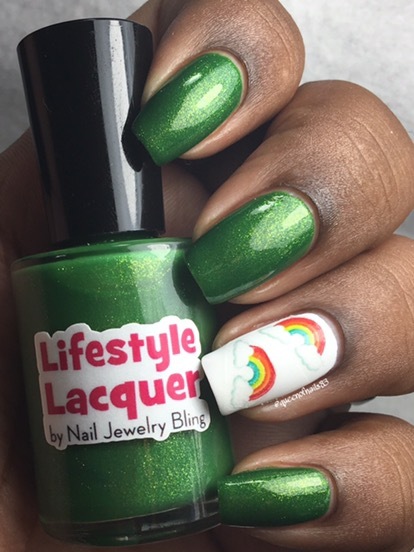 Accent finger is a white base with rainbow water decals from Green Eyed Goddess from this box. 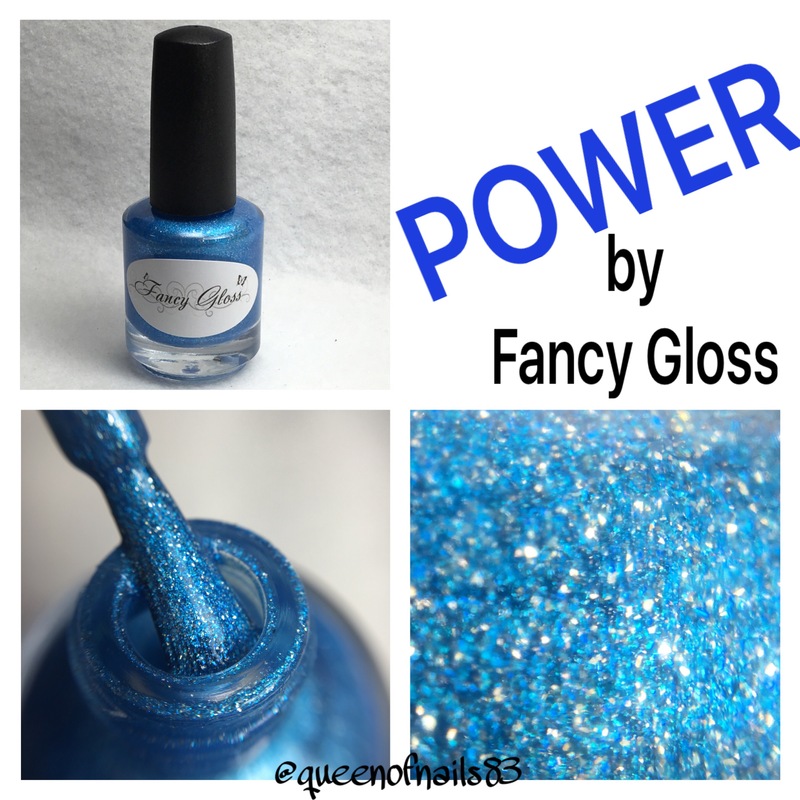 Power is a blue polish with silver glitter shown in 3 coats to reduce VNL. 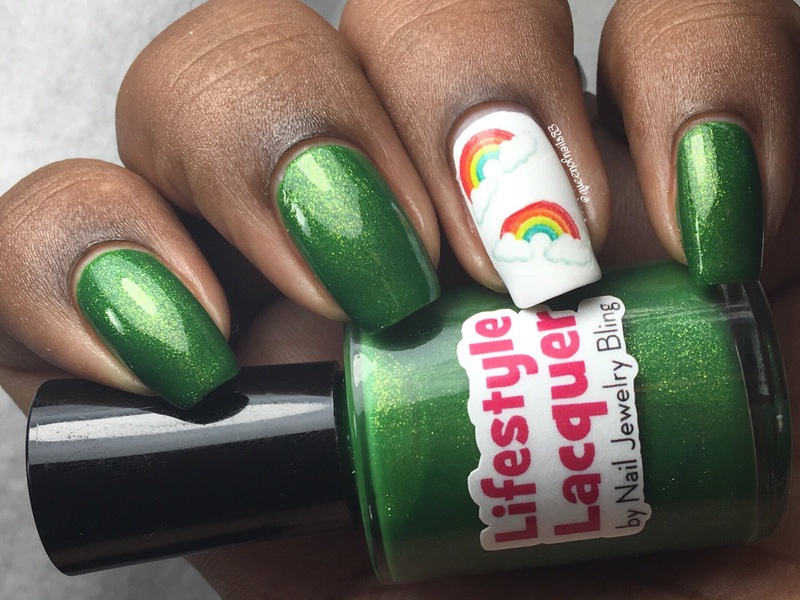 Accent finger is a white base with rainbow water decals from Green Eyed Goddess from this box. 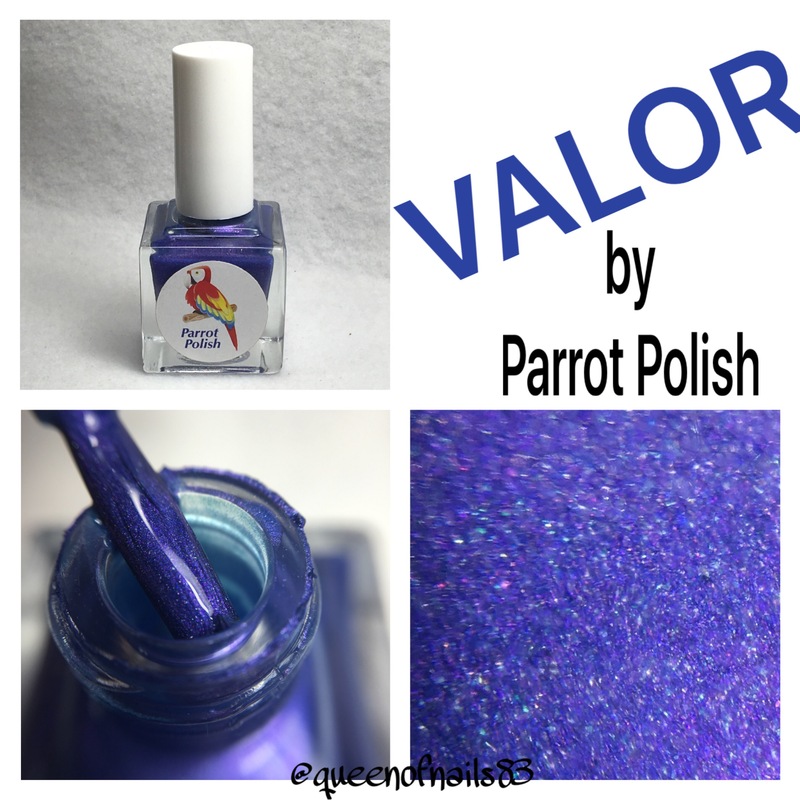 Valor is an indigo shimmer with micro blue, purple and pink glitter. Shown in 3 coats to reduce VNL. 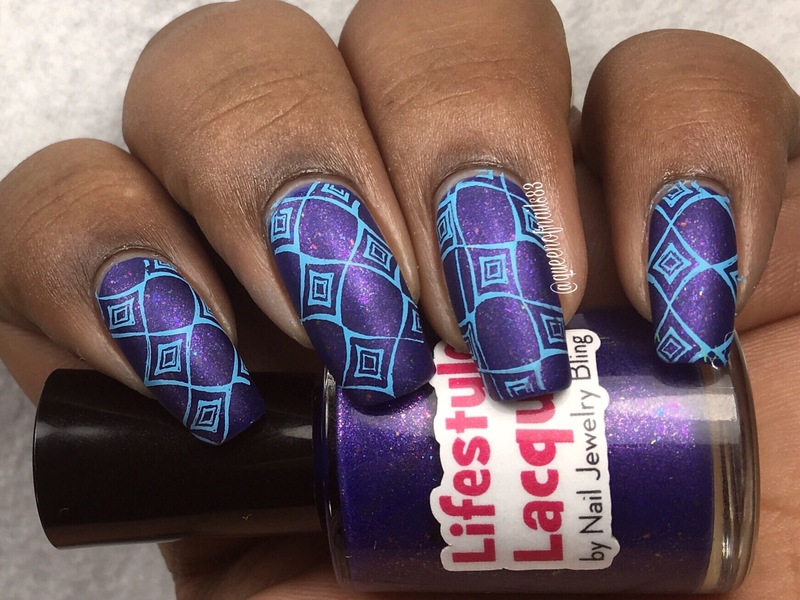 Accent finger is topped with rhinestones from Lifestyle Lacquer by Nail Jewelry Bling from this box. 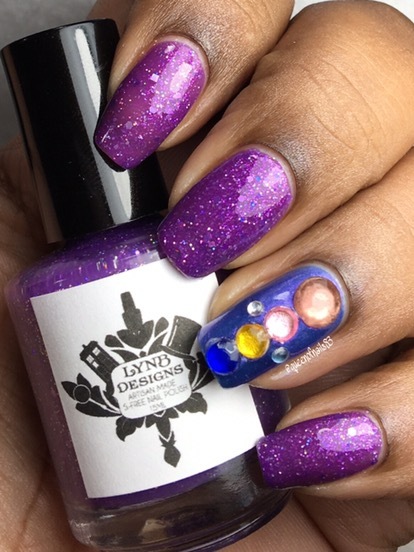 Strength is a purple jelly with micro glitter and small square and hex glitter. shown in 3 coats to reduce VNL. 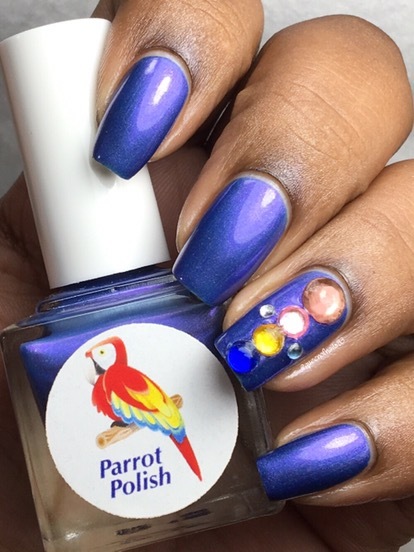 Accent finger is Valor by Parrot Polish topped with rhinestones from Lifestyle Lacquer by Nail Jewelry Bling from this box. Rachel’s mom has set up a GoFundMe and any donation would be greatly appreciated.